The business you lead is built on an idea. In the turbulent current of daily work filled with product specifications, customer projects, internal meetings and hundreds of other items, it’s easy to lose sight of the idea. The idea started in someone’s mind, maybe even yours. Over the years, the idea transformed into offerings in the form of products, services, experiences, etc. that a group of potential customers found valuable and were willing to pay for. Cash flow, receivables, intellectual property, brands, careers–everything flows from the idea. Just because someone has a senior-level title on their business card doesn’t automatically qualify them as an effective strategic thinker. Similarly, just because someone is a new entry-level manager doesn’t mean they can’t contribute valuable insights that can potentially shape the organization’s strategies. Action, which requires executing strategy to achieve goals. -What is my key insight, learning or take-away from this meeting/teleconference? -Based on the strategy to achieve my goals, what are the trade-offs I need to make with my time, talent and budget? -Am I working on an activity that is important to executing the strategy, or is it an urgent, but unimportant issue that’s taken me off plan? 1. Time (96%). The most commonly cited strategy challenge is time. With more responsibilities and fewer people to handle them, many managers are overwhelmed with activities. While checking lots of tasks off a to-do list each week may foster a sense of accomplishment, activity doesn’t always equal achievement. If the individual tasks aren’t strongly supporting the strategy, then we may fall into the trap of activity for activity’s sake. 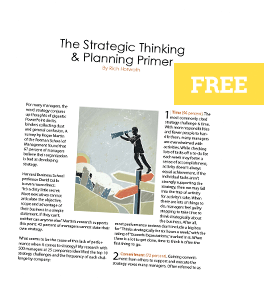 When there are lots of things to do, managers feel guilty stopping to take time to think strategically about the business. After all, most performance reviews don’t include a big box for “Thinks strategically for four hours a week,” with the rating of “Exceeds Expectations,” marked in it. When there is a lot to get done, time to think is often the first thing to go. 2. Commitment (72%). Gaining commitment from others to support and execute the strategy vexes many managers. Often referred to as “buy in,” commitment can be challenging for several reasons. If the people expected to execute the strategy aren’t aware of it, or don’t understand it, then commitment will be non-existent. According to a study out of Harvard Business School, a shocking 95 percent of employees in large organizations are either unaware of, or don’t understand, their company strategies. This finding may be rejected out of hand by some senior leaders, but it’s crucial to find out just how high that percentage is for your group. Another reason buy in is lacking is because many people don’t understand the “why” behind the strategy and how it will help them achieve their goals. A study of 23,000 workers found that only 20 percent said they understood how their tasks relate to the organization’s goals and strategies.If leaders fail to share the why behind the strategies and translate them to people’s respective work, the level of commitment will be minimal. 3. Lack of priorities (60%). A great cause of frustration among managers is the overall lack of priorities at the leadership level. When everything is deemed important, it creates an overflowing plate syndrome. If clear priorities are not established up front, then it becomes difficult for people to determine what they should be working on and why. This lack of priorities prevents people from taking things off of their plate, resulting in the frustration that comes with being spread too thin across too many initiatives. A lack of priorities is a red flag that the difficult work of making trade-offs was not accomplished in setting the strategy. Good strategy requires trade-offs, which in turn helps establish priorities by filtering out activities that don’t contribute to the achievement of goals. Great strategy doesn’t magically emerge from Excel spreadsheets, or elaborate PowerPoint slide decks. Great strategy is created by great strategists.